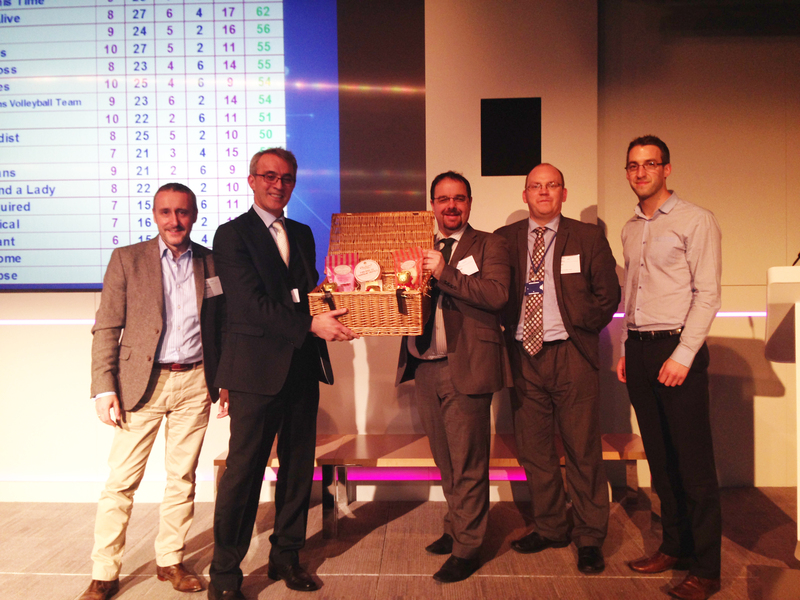 On the evening of Monday 2 December the Business Disability Forum held their annual Technology Taskforce Quiz kindly hosted by Barclays at their headquarters in Canary Wharf. There was an excellent turnout of 16 teams comprising a wide variety of our Partners and their guests. Those present included Barclays, American Express, Atos, EY, Remploy, Lorien, Micro Focus, Microlink PC, Opencast Software, Royal Mail, Cognizant and Polaris Financial Technology. Proceedings got off to a start with a welcome from Andrew Witney, Chief Information Officer for Barclays and Paul Day, Chief of Staff at Business Disability Forum, who highlighted the important work of the taskforce including the recent development of technology research and advisory company Gartner introducing accessibility as part of their “Magic Quadrant” model. Andrew and Paul recognised that the quiz was a fun way to progress a serious issue. The quizmaster for the evening was leading disability consultant and champion for equal opportunity and diversity Phil Friend OBE. Phil presided over the two 45-minute sessions with characteristic wit and humour whilst making the questions thought-provoking and informative at the same time. The pub-quiz style format included questions that tested people’s knowledge and appreciation of important disability-related topics such as employment, accessibility, being adequately served as a disabled customer, assistive technology, disabled people playing leading roles in business and the community and headlines from prominent disability news stories of 2013. There was a healthy portion of vital statistics drawn from the most up to date research. The multiple choice questions were surprising to some and well-known by others. They included: the average cost of a reasonable adjustment being only £75 thus dismissing the perception that such adjustments are inhibitively expensive, that 83% of people with disabilities have taken their custom elsewhere due to poor website accessibility emphasising the importance of businesses getting their online presence right, that there are around 11 million people in the UK with some form of disability and within this group there is a spending power of up to 80 billion pounds –giving the message that there’s a true business as well as a moral and reputational benefit to being a disability-smart organisation! No pub quiz worth its salt would be without a music round and the final questions of round two involved Phil reading out the first line of the lyrics of some past hit songs and the task was to write down the second line of the song along with the artist. Not easy without hearing the music but this still continued the disability awareness theme as each artist in the answer was revealed to have succeeded despite having some form of disability such as Cindy Lauper who is dyslexic, Michael Bolton who is deaf in one ear and Ray Charles who of course was blind. First, second and third places went to Microlink, EY and a mixed team of colleagues from BiTC, Oracle and others. Dr Nasser Siabi, CEO of Microlink, magnanimously donated his first prize hamper to the team who came second. The evening was a great success and there was much engagement from all tables, providing the opportunity to network and meet new people, enjoy good food and drink whilst having some fun and learning more about disability in general. Well-deserved thanks and congratulations to Barclays for hosting, Phil Friend for such entertaining content, the events team at Business Disability Forum for their hard work in organising and all those who came along and took part. This entry was posted in Post-event round up and tagged Barclays, Quiz, Technology Taskforce by disabilitysmart. Bookmark the permalink.